This is the official website for all members of the O’Dubhda Clan. The original Gaelic name, meaning “descendant of the Dark One”, has changed over the years as different spellings have been used.Therefore, anyone with the names O’Dowd, Dowd. Dowds, Doud(e) Doody Duddy, or the others mentioned in Variations list below, is descended from the 10th century King of Connacht, Aedh Ua Dubhda. This makes the O’Dubhda surname as old if not older than any in Europe. This was the first time that the surname was used but you can also be very proud of the fact that the clan can be traced back in an unbroken line for over 1500 years to just before the time of St Patrick. The O’Dubhda’s have a lineage that is older than that of the English Royal Family and are descended from an ancestry as ancient as any in Europe. 1. It will serve as a source of information about the activities of the members of the Clan, and in particular will provide details of the triennial rallies. 2. It will provide a means for clansmen(and women)to contact each other (via the forum) and possibly assist each other in genealogical research. 3. The history of the O’Dubhda Clan will be outlined in a series of pages that will be added to periodically. 4. Stories and legends, as well as sites associated with the name, will be added to as they become available. 5. In the Registration section it is hoped that members will enter some details about themselves and upload a photo if they wish. 6. Input and suggestions from members would be welcomed so that the site can be improved. There are rallies, or “hostings”, held every three years to which all members are most welcome. These are quite informal gatherings whose main purpose is to allow members of the Clan to meet each other, socialise and talk (we seem particularly good at this!). 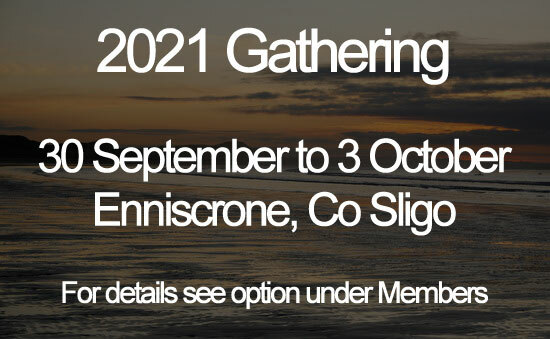 While each rally is different there is a formal Clan Council meeting and, since 2000, the inauguration of a new Taoiseach (Chieftain) and Tanaiste (Heir) according to the ancient Brehon Laws. Trips of historical interest are arranged, although these are optional but usually very interesting. There are also genealogical presentations/discussions and exhibitions and the rally normally finishes with a banquet in Belleek Castle, Co. Mayo. The name O’Dubhda, and its variants, comes from the 10th century King of Connacht, Dubhda, meaning “the Dark One.” The description most likely referred to his black hair, or dark complexion, although it could have been a nickname! Dubhda had an older brother, Caoimhin, but succeeded to the kingship in preference to him. A later legend attributed this to the intervention of St Gerald of Mayo (See Stories), although under the Irish system, the eldest son did not always succeed the father. The first to use the surname was Aedh (Hugh) Ua Dubhda, the King of Connacht who “died an untroubled death” in 982, making this one of the earliest surnames in Europe. As the use of surnames became common in the 11th and 12th centuries, the descendants of Aedh continued to use the name O’Dubhda (“O” meaning “grandson of”) to distinguish their royal lineage from that of other families.